In alternative music it’s rare that a musicians solo work garners as much attention and acclaim as their main projects. Anthony Green (of Circa Survive) was the recent exception to the rule, as his second full-length ‘Beautiful Things’ cracked the Billboard Top 30. 18 months later he’d be hoping for similar success and hopefully he gets it as, like everything he does, ‘Young Legs’ is brilliant. Anthony Green has always been a complex lyricist and musician with no qualms about pouring every inch of himself into the music he plays. Honesty and emotion have always been his priorities, and it continues to make him one of music’s most interesting and genuine characters. ‘Young Legs’ is full of musings, reflections and heartfelt sentiments, and it’s everything you’d expect of a Green release and more. As with all of his material his sublime vocals take centre stage and add something more to every melody and line but the other main elements of ‘Young Legs’ – production, instrumentation, lyrics etc – are all of an incredibly high standard. With solo projects it’s common that very little else matters apart from the soloist and their vocals, but Green has made every effort to make every aspect of ‘Young Legs’ as impressive and intricate as possible, meaning the album is truly remarkable. It also sees a slight departure from his past solo releases, being more adventurous and expansive. There’s hints of his current band Circa Survive, especially on the huge opener ‘Bleaker’ and tenth track ‘Shine’, but there’s also traces of blues, folk and rock so you get a lot of variety, which is ideal considering Green is capable of adapting to any scenario and making it his own through his distinctive and stunning voice. Understandably, his voice is the main attraction. Green’s vocals are generally unrivalled and he merely uses the varied backdrops as canvases to complement his own exceptional delivery. ‘Majestic’ is one of the most fitting adjectives to do Green’s vocals justice, and it fits for the majority of his third solo full-length. Be it over gorgeous soundscapes (‘You Have To Believe It Will Happen’), or straightforward acoustic numbers (‘I’ll Miss You’) he gracefully soars, matching the ebb and flow of the music perfectly. He makes it seem ridiculously easy and it’s a testament to his own ability that he can weave and glide his way through complex instrumentals and stunning harmonies so well. It allows him to cover ground and impact his audience in a way most vocalists could only dream of, and it means that ‘Young Legs’ is absolutely engrossing, as Green delivers one of the best vocal performances you’re likely to hear in 2013. The unnerving and eerie vocals of ‘Breaker’ for the most part take a backseat to the sunshine sweet melodies of tracks like ‘Anytime’ and overall ‘Young Legs’ is uplifting despite being intimately personal. Green addresses his own faults on ‘100 Steps’ and reflects on past relationships on the more poignant ‘Conversation Piece’, on which he sings ‘we laid our foundation on a sinkhole, and then expected it to stay’. It’s honest and thoughtful music that listeners can relate to and admire without feeling intrusive. There are plenty of tracks on ‘Young Legs’ which are genuinely beautiful pieces of music, the title track being one of them. A jaunty intro gives way to more stripped back instrumentals with Green crooning over them, singing ‘tell me sick love child driven with lust’ in his trademark powerfully emotive tones. It’s a touching song with a distorted final verse that makes him sound almost ethereal. Everything comes together in a stunning mesh of complementing sounds, a haunting orchestra of both pain and love, and it’s one of the strongest moments on ‘Young Legs’, and also one of the most effecting. Stripped back track ‘I’ll Miss You’ is an equally gripping affair, being an excellent torch song which allows Green to deliver some of his best goosebump-inducing vocals since ‘Spirit Of The Stairwell’. Even shortest track ‘Stolen’ manages to be haunting, despite only containing a few lines and credit should be given to producer Will Yip, who gives a polished shine to the record almost equalling Green’s. Fifth and best track ‘When You Sang to Me’ is one of the best songs Green has worked on to date, with a dynamic rising chorus and verses on which he is giving free vocal reign to really hit his stride. It seems as if everything on ‘Young Legs’ is there for a reason and there’s very little filler, even though every three tracks are separated by a shorter track that isn’t quite as strong. ‘Too little, Too Late’ crawls along on a blues inspired riff with whimsical vocals ringing out over it. It isn’t as effecting as the longer tracks but it does display yet another versatile side to Green. Unlike ‘Beautiful Things’ there are no guest vocals, which makes the album seem much more organic, allowing him to really steal the show and take the listener on a journey. ‘Young Legs’ is honest, expertly crafted music that makes the most of Green’s unique voice whilst matching it at times with exquisite instrumentals. It all comes together seamlessly to make an album that has the capacity to both inspire and enthral. 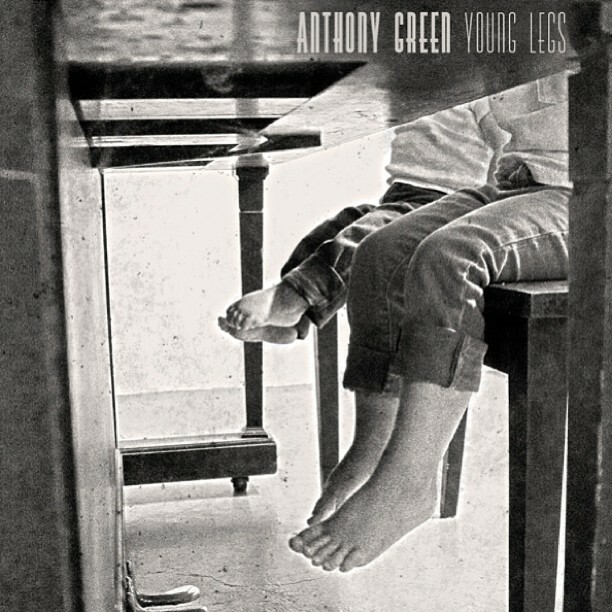 If you’re already a fan of Anthony Green or Circa Survive then ‘Young Legs’ could easily be one of the best albums you listen to this year.